Many bacteria have a sense of touch that tells them when they are on a surface. We study surface sensing that results in biofilm formation by the gram-negative bacterium and opportunistic pathogen Pseudomonas aeruginosa. Biofilms, which are surface-associated multicellular communities encased in an extracellular matrix, are responsible for chronic P. aeruginosa infections in humans with underlying diseases such as cystic fibrosis. Biofilm infections are resistant to antibiotic treatment and tend to escape immune surveillance. 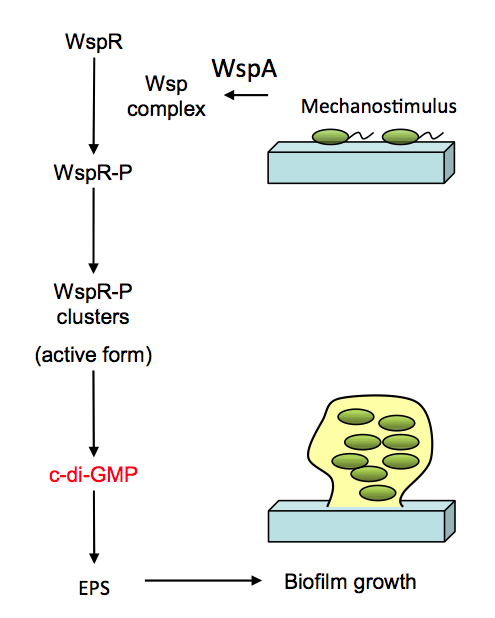 We study a membrane-bound signal transduction system, called the Wsp system that senses a physical stimulus when P. aeruginosa attaches to a surface. The output of the system is c-di-GMP, a small molecule that stimulates biofilm formation. Our goal is to determine how the Wsp system works. We have mutants, mutant screens, and technical approaches of high- resolution microscopy in place to elucidate the mechanism of touch sensation by the Wsp system. There are a number of strategies that bacteria use to sense and respond to surface, but none has yet been elucidated mechanistically. We hope to reveal one mechanism of bacterial surface sensing that has important implications for the virulence of P. aeruginosa, particularly with regard to difficult-to-treat biofilm infections.